Recently, I traveled to Northwest Arkansas to explore and dine at restaurants in Bentonville AR. It was all part of a Food and Travel Summit hosted by Visit Bentonville. What a delicious experience! Long known as an outdoor destination for hiking and mountain biking, Bentonville restaurants are answering the call for great food for hungry adventurers like us. On my recent sponsored visit, I sampled dishes from many of the downtown restaurants, talked with area chefs, and learned how this once sleepy town has blossomed into a destination for hungry adventurers. Bentonville, Arkansas is a city of nearly 50,000 in Northwest Arkansas’ Ozark Mountains. It’s known most notable as the “Town That Walmart Built.” It’s where Sam Walton opened his 5 & 10 store on the Bentonville Square in 1950. Today Walmart’s headquarters is based in Bentonville and many businesses and suppliers that work with Walmart have an office or presence here. Today over 30 people a day move to the region and that influx of people is bringing in new influences, new foods and flavors. Bentonville is easy to reach. Daily flights into XNA – Northwest Arkansas Regional Airport are available on Delta, American, United, and Allegiant. Bentonville is less than a 4 hour drive from me here in Oklahoma City. So our family has been to Bentonville and Northwest Arkansas several times. This area is beautiful! It’s nickname is the “Natural State” and it’s easy to see why. During this last visit, fall with all its splendid colors were on display. Trees presented brilliant reds, yellows, and gold color. Bentonville has ample opportunities to get outside and “Play”. Bike culture is alive and VERY well in this area. It’s easy to get around on bicycle, plus it’s a great way to see the area. Paved bike paths stretch north of the city and down to Fayetteville (36 miles away). As an IMBA Silver Level Ride Ceter, the city has miles of unpaved singletrack mountain bike trails. These off-road trails range in length and skill level. So anyone can ride. All that outdoor fun makes one hungry. The Bentonville food scene has restaurants serving every type of cuisine possible. From one of the country’s one gluten free restaurants (The Preacher’s Son) to local coffee roasters (Onyx Coffee Lab) and Filipino food (food stall at 8th Street Market). There is something for everyone. Back in 2010, Bentonville had four notable restaurants, Fred’s Hickory Inn, Table Mesa, River Grill, and a burger place that has since moved. With the opening of Crystal Bridges in 2011, this area has become a rich food scene highlighting regional ingredients with international flavors. Area farmers are working with local restaurants to showcase the area’s rich abundance. In 2014 the Wall Street Journal called Bentonville an up and coming culinary scene. They hit that nail on the head! You just have to visit the local Farmer’s Market or area restaurants to discover the truth in this statement. Places like Brightwater Center for the Study of Food and inspiring the next generation of culinary leaders and the community through education. Housed inside the 8th Street Market building complex, Brightwater and other food vendors provide the chance to learning in the kitchen, shop, eat, and be entertained. When in Bentonville, there are so many places to enjoy. I’ve put together a list of my favorite downtown Bentonville restaurants and beyond. These are the places I return to again and again. This restaurant sites on what was the Wildwood Camp, a youth summer camp, and is one of oldest restaurants in Bentonville AR. Several of the old buildings including the historic log cabin still remain on the property. The Cabin how houses a bar and another serves at the restaurant’s smokehouse. Fred’s Hickory Inn is known for their delicious BBQ and Italian dishes. Recommended: Fred’s Signature BBQ Ribs and the Spaghetti Primavera. Bike culture is here to stay in Bentonville. This pizzeria and pub is located on the Downtown bike trail. It’s known for their delicious wood fired pizzas, but they also have hot sandwiches, burgers, and salads. If you want to try something unexpectedly good, try the Chicken Curry fries. They offer a full bar and good selection of beers on tap. Recommended: The BBQ pizza and the Arkie pizza with ham, portobello, and jalapeño. One of Bentonville newest food venues, 8th Street Market calls itself a “community-focused food hub.” The large complex houses on site food stalls, restaurants, shops, entertainment, and Brightwater culinary school. Starting with something sweet, you’ll want to visit Markham and Fitz chocolate shop. They create bean to bar chocolate that is absolutely divine. Add to that an assortment of chocolate baked goods that every local will rave about. Recommended: Chocolate chip cookies, chocolate mousse, and triple layer chocolate cake. For Mexican food, there is no place better in the area. 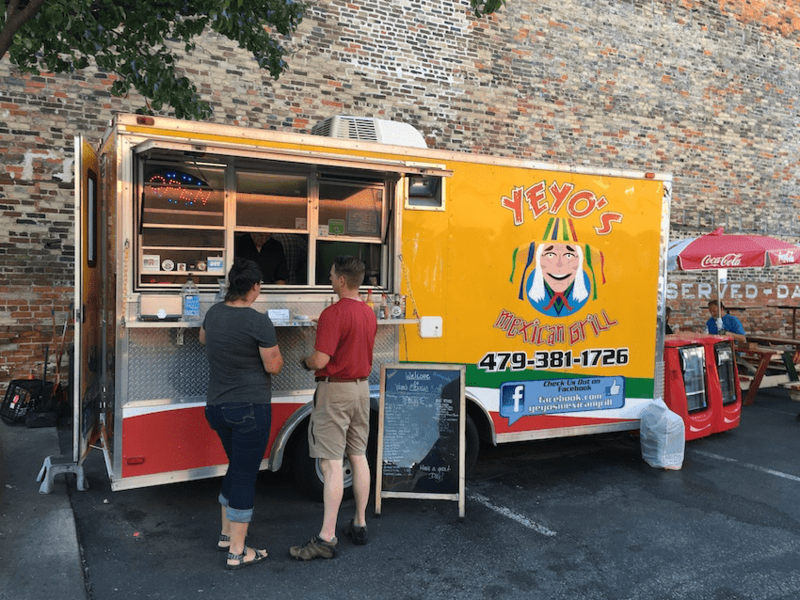 Yeyo’s started as a food truck that transitioned to a brick and mortar restaurant. You can still find the food truck stationed on Central Ave. just of Bentonville square. Recommended: Bob’s Campechano, Mexican Street Tacos, and the Cochinita Pibil. This food stall is dedicated to all things cheese. Pick up a cheese board with three cheese, meat, and accompaniments for just $15. Not sure what cheese you want, the staff provides samples to help you decide. Staff is fantastic and they offer cheese classes every month. Brightwater isn’t a restaurant, but is a culinary school. It’s full name is Brightwater: Center for the Study of Food. I mention it here because they offer community events and hands-on workshops to the public. Visit www.brightwater.org to learn more. Some of the BEST restaurants in Bentonville AR are found downtown both on and just off the square. During warm weather months, the Bentonville Square Farmer’s Market is a must stop destination. Within a few blocks radius, you will find vastly different flavors being served using local ingredients. Each have their own take on “High Country Cuisine”, a term coined by Case Dighero as a style of cooking using old Ozark recipes showcasing local ingredients. Housed inside an old church, the Preacher’s Son is one of the only 100% gluten free restaurants in the country. It is a great example of the culinary revolution happening in Bentonville. Executive Chef Matt Cooper brought his vision of upscale dining to the area. Working closely with farmers, his menu reflects the quality of products Northwest Arkansas has to offer. Highly Recommended: Mushrooms with house made ricotta, beets with smoked cashew butter, slow braised pork shank, and sweet potato gnocchi. After dinner, head down under The Preacher’s Son to a Bentonville speakeasy called Undercroft. Enjoy carefully crafted cocktails in this hidden bar. There are so many things to do in Bentonville AR from the bike and nature trails to world class museums. Hungry visitors delight in the wide range of dining options offered at Bentonville restaurants. On your next visit to this part of Northwest Arkansas, start here.